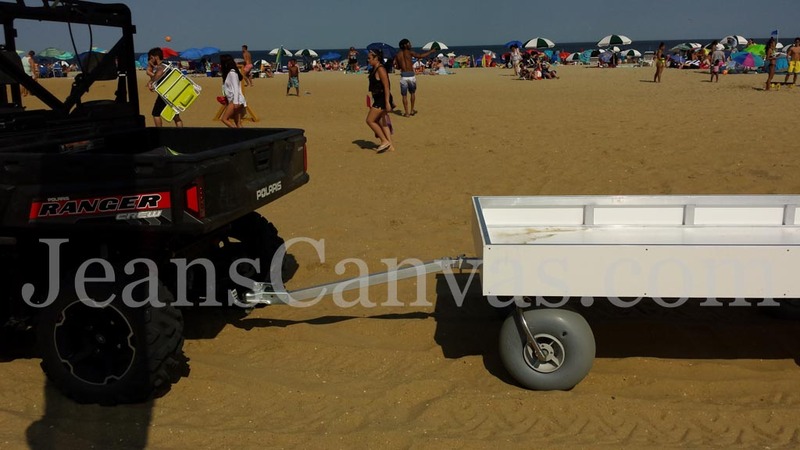 The Towable Custom Beach Carts we fabricate 100% in our metal shop here at Jean’s Canvas Products are made out of 60/63-T52 Aerospace Military Grade aluminum. We do all the MIG welding with our Certified professionals. We accomplish tow ability by adding our own receiver with our own articulating tow bar that has a trailer coupler that is connected to an ATV or some other type of off road vehicle. Jean’s Canvas Products also offers you a cart to cart connector so multiple carts can be towed at once – similar to the style of a train. All attaching hardware is done with 3/16” Marine Grade Stainless Steel and casters are Stainless Steel. This Towable Custom Cart is sturdy and rugged. Sand is no challenge with the Wheeleez Tires we use. Haul everything you need to get set up on the beach or other venue. We at Jean’s Canvas Products make what you need the way and size You desire. We are all about making You and Your Towable Custom Cart our top priority. If you are interested in Graphics or your logo on your Custom Towable Custom Beach Cart, look no further. We do that too! Contact us today and lets get creating for Your look and need today. We ship everywhere!